Atlanta, GA – April 16, 2018 – Atlas Roofing Corporation has created the EnergyShield® Wall Builder Tool, an industry resource designed for contractors and architects seeking guidance on designing with polyiso wall insulation. The EnergyShield Wall Builder Tool is hosted on the Atlas Roof & Wall Insulation website and allows any user to virtually construct a wall layer by layer. As each layer is chosen, the user can see the wall rendering as it is assembled. Once the user has created a final product, the rendering of the wall assembly becomes available for download, along with the matching specifications and submittal materials. The EnergyShield Wall Builder incorporates all EnergyShield products, including EnergyShield Pro, a foil faced polyiso continuous insulation product for commercial exterior walls. EnergyShield® Pro meets all commercial building requirements: NFPA 285 compliance, Class A flame spread, and a thin wall profile of 4” thickness or less. In addition, EnergyShield Pro meets NFPA 286 requirements for exposed interior use. EnergyShield Pro allows for short term savings and long-term energy efficiencies, incorporating an integrated weather and air barrier. 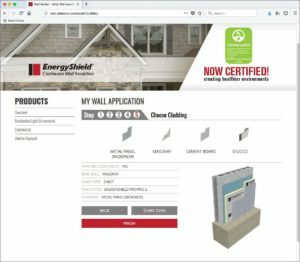 The EnergyShield Wall Builder Tool was custom-built from hundreds of digital renderings of wall assemblies and is capable of producing millions of finished combinations. Please visit Atlas® online at wall.atlasrwi.com to use the EnergyShield Wall Builder. Atlas Roofing Corporation is an innovative, customer-oriented manufacturer of residential and commercial building materials. Atlas has grown from a single roofing shingle manufacturing facility in 1982 into an industry leader with 24 facilities in North America and worldwide product distribution. All Atlas products are manufactured in state-of-the-art facilities and shipped worldwide from its network of manufacturing plants and distribution facilities in the United States, Mexico and Canada. Atlas Roofing Corporation is made up of 4 major divisions: Roof & Wall Insulation, Shingles & Underlayments, Expanded Polystyrene and Web Technologies. See more at: http://www.atlasroofing.com/about#sthash.xUluB4Tm.dpuf.